Members and officers in Rock Bridge's PTA are creating little packages of candy and blowing up balloons for the annual Valentine's Day sale. Photo by Daphne Yu. 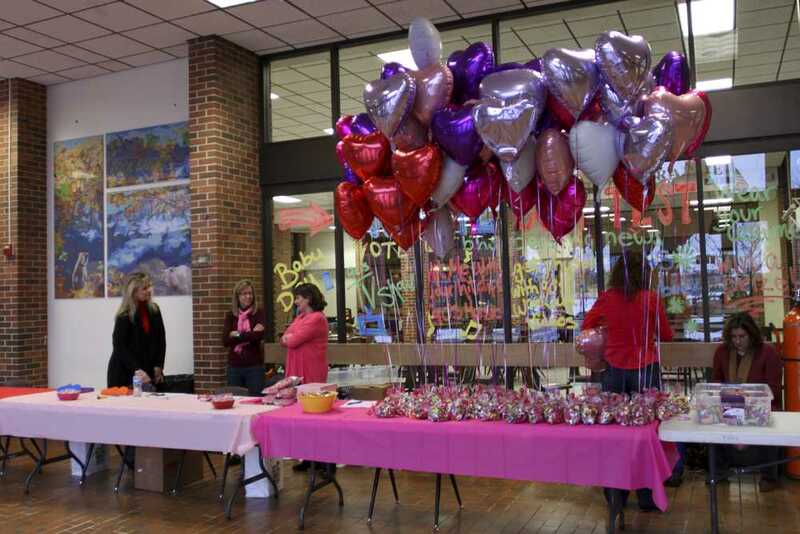 ThePTSA will hold their annual Valentine’s Surprise fundraiser Feb. 14. While the deadline for purchasing chocolate-covered strawberries has passed, parents and students can still order a Valentine bag filled with candy or a Valentine Teddy Bear with suckers until 9:00 a.m. Feb. 14. Both are $5 and students should return forms to the RBHS office. This tradition started more than ten years ago to raise money for the RBHS PTSA. Kay Hake, who chairs the event, said the sale is an exciting way to spread Valentine’s cheer. Sophomore Courtney Bach has participated in the RBHS tradition for several years. She received her first Valentine’s Day surprise when she was in eighth grade from a friend at RBHS. Last year she sent chocolate-covered strawberries to one of her friends. Junior Olivia Guess is on the receiving end of the Valentine’s Day surprise. While she prefers to make gifts for her loved ones, her parents like to spoil her with treats on the special day. Coordinating the fundraiser is no simple task for Hake. Her job includes contacting the Candy Factory to place the order for chocolate-covered strawberries, sending out order forms through RBHS’s daily news email, putting all the orders into a spreadsheet and setting up on the day of. After doing it for over a decade though, she still finds the work rewarding. “It’s a really fun event at Rock Bridge High School and the kids get so excited when they see that they have something to pick up,” Hake said. This is such a cute tradition! My friend got chocolate covered strawberries and shared it with me, and was super happy at the surprise!